Gary Beard's match report for the Sky Bet EFL League 1 match vs Wycombe Wanderers played on Saturday 13th April 2019 is now online. The latest winner of the Trust's 100 Club is Andrew Haddow winning £29.50. Why not join up for just £5 per month giving you the chance to win around £30 each week. Visit our Fundraising Page for further information. 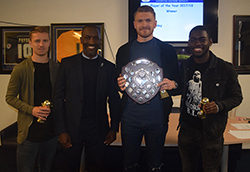 The Shrimpers Trust can now announce details of the 2018/19 Season Player of the Year Awards. The event will be held on Monday 29th April 2019 in the Shrimpers Bar, Roots Hall, and will be hosted by SUFC Legend and Match Day Host David Crown. Late in 2018, the Trust were awarded some funding from the Aviva Community scheme and the Trust were delighted to welcome a group of 6 amazing boys from Kingsdown school on 16th Match for a 'Day to Remember'.